Smelling Glue Again, with the Enterprise-E. In my early and mid-teens I loved making plastic models, and I got pretty good at it. In fact I recall I even had a couple of pieces on show at a local modelling exhibition. I had dreams of emulating my hero. special effects model wizard Derek Meddings, the man who created all those wonderful vehicles for the Supermarionation TV shows like Thunderbirds. Then I hit 16 and along came the three Bs – Birds, Bikes, and Booze – or if you prefer, motorbikes, an interest in girls, and hanging out at the pub with my mates. Model making was forgotten. Over the last few years every time my wife was in the local craft and hobby stores I’d find myself wandering over to the plastic kits aisle, and reminiscing. 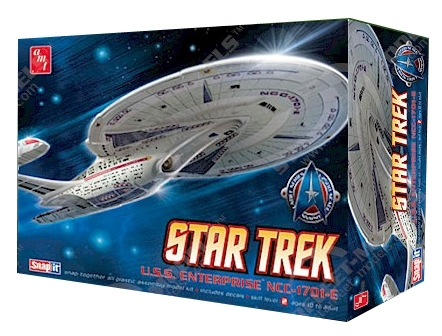 Gill decided enough was enough and bought me a AMT 1/2500 model kit of the Enterprise-E for Christmas. Then my daughter got me a classic Batmobile kit for Father’s Day, and while I was in Hong Kong on a business trip earlier this year I picked up a Gundam Suit model kit. Having the kits wasn’t enough, I still didn’t have any of the basic modelling kit tools. – That is until today. Another visit to the hobby shop, and another stroll down the aisle with the model kits resulted in me walking out with another kit; but this time it was accompanied by a “starter” kit of tools, cement, paints and so on. I’ve made up a work bench in a corner of the basement, and now I’m ready. 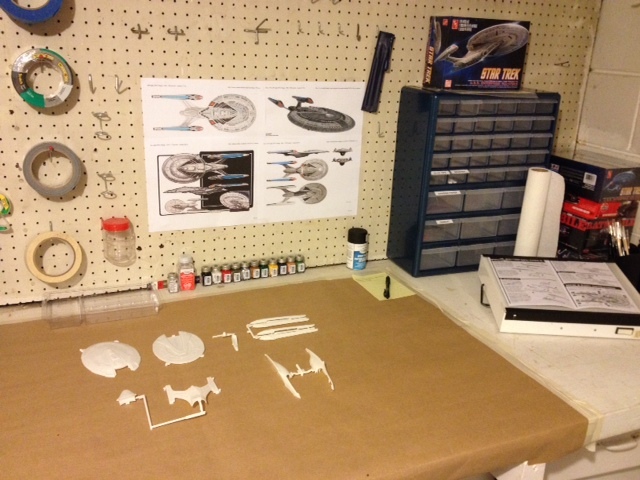 The first build will be the Enterprise-E kit that Gill bought me at Christmas, and I thought it might be fun to blog about how I get on as I try and knock the cobwebs of some skills I haven’t used in nearly forty years.